This is the second of a series of interviews with Remingtonians. If you would like to be featured, please contact the editor. Melissa Archer and Pete Morrill live on the 200 block of West 27th Street. Melissa: I’m from Ohio, and Pete is from Delaware. We work in historic preservation. Pete: We’re both history professionals and history hobbyists! We love rummaging for cheap antiques and vintage clothing. Occasionally we dress up for reenactments. Earlier this month we went to the WWII Reading Air Show and last month I was in the 150th anniversary of the Grand Review Parade in Washington. Melissa: Our main hobby is restoring our rowhouse. We are trying to put it back to how it was at the time it was built in 1917 by dumpster diving for salvaged parts from around the neighborhood and from Second Chance. That occupies a great deal of our time. Pete: I had friends nearby and there was an affordable house for rent here. We were happy here, so we bought a home 2 blocks away in 2014. Pete: We’d like to see the corner stores put back into use. For instance, there’s a vacant plumber’s store across the street. Melissa: Yes, I wish there were more stores nearby, including restaurants. Pete: I’d like a bakery, and a real corner grocery. Melissa: My pride and joy is Moses, my big, white, fluffy dog. 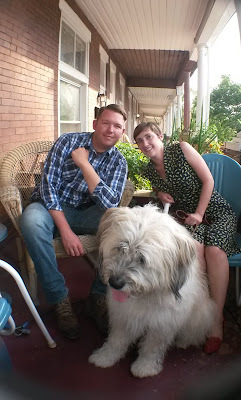 We think he is a Great Pyrenees Sheepdog mix. He is a rescue and is unfortunately afraid of most strangers, but we're working on acclimating him to city life. Pete: The people here, and that it’s close to several parks. I think that’s a real advantage.